When I was about six years old or so, my mother was participating in an arts and crafts fair in Evanston, Illinois, and as a way to kill a couple of hours and keep my younger brother and I out of her hair, my father took us over to the now-long-shuttered Varsity Theatre to go see some special matinee presentation. I cannot recall what film screened that day—since the younger brother was around, my guess is that it was almost certainly some Disney film of no particular note—but what I saw inside that theater has remained etched into my mind ever since. It was a poster for a film, and the central image was a close-up of a blue-tinged face seen from the nose down, screaming in horror over some unseen fright. At the top of the poster was the tagline “The Only Thing More Terrifying Than The Last 12 Minutes Of This Film Are The First 92.” Below that, spelled out in gaudy red letters that practically leapt off the poster itself, was the title, a single word that I had never heard before in my life. I knew there was no way that I was going to be able to convince either parent to take me to see this thing, but I also knew that I would one day see it for myself, if only to find out if it lived up to the thrills and terrors promised by the poster. That was my first exposure to Dario Argento’s 1977 shocker “Suspiria.” I finally caught up to it a decade or so later, first on home video and later in its proper setting on the big screen, and was astounded to discover that, even though my expectations for the film were sky-high, thanks to things I had read about it and its creator in books and magazines like the late, great Fangoria, it not only met my expectations but exceeded them. A riot of sound, fury and imagery that somehow managed to come across as both gruesome and poetic, it was unlike anything I had seen before, and even though I cannot count the number of times that I have viewed it over the years, I continue to come away from it stunned by its combination of visceral horror and visual beauty. And while I am fully aware that Argento can be an acquired taste, this is perhaps the one film of his that everyone with an interest in the horror genre can embrace. The film opens with American ballet student Suzy Bannion arriving in the middle of a dark and stormy night at Germany’s prestigious Tanz Dance Academy, only to be refused admittance at the door. That same night, another student flees the school to the apartment of a friend in town with a wild story to tell but before she can, they are both brutally murdered by a black-gloved assailant. The next day, Suzy is allowed in the school and meets vice-director Madame Blanc and chief instructor Miss Tanner. Although Suzy makes plans to live off-campus, she is moved into the dorms after a fainting spell so that her condition can be properly monitored. A series of bizarre events begin to occur, and those who begin to get too close are dispatched in gruesome ways. As Suzy eventually learns, the school’s founder, one Helena Markos, was a malevolent witch, and the school is a front for her coven. As bizarre as all of this may sound in the recounting, it is nothing compared to seeing it play out on the big screen. Having more or less obeyed the rules of proper narrative development in his previous works, Argento decided to cast all of those notions aside for “Suspiria” in order to provide viewers with an overwhelming experience of pure sensation, to help suggest a world where even the most seemingly mundane things—ranging from a dance school to a trip through an airport—hint at pure malevolence lurking beneath seemingly normal facades. The best way to approach it is to look at the entire thing as a dark and decidedly adult version of the fairy tales that we all heard as children. After all, this is a film that literally opens on a dark and stormy night and includes other familiar tropes, such as dark forests, witches, spells and a pure and innocent heroine. Although Argento used Walt Disney’s “Snow White and the Seven Dwarves” as a model for the film’s visuals, there is the sense that it helped influence the story as well. This all might not make a lot of sense in hindsight, especially if you are trying to explain it to someone else, but it does maintain a certain dreamlike logic that keeps the film moving along without spiraling out of control. Argento further develops the film's dreamlike nature by utilizing a truly go-for-baroque approach that takes all of the stylistic tricks at his disposal and pushes them to their limits and beyond. One of his key collaborators is cinematographer Luciano Tovoli, whose previous efforts, such as Michelangelo Antonioni’s “The Passenger” (1975), were marked by a down-to-earth realism. In “Suspiria,” he went as far in the other direction as possible. In this film's unearthly visual scheme, mirrors, filters, enormous arc lights and offbeat colors are accentuated by way of Technicolor’s famous three-color dye transfer process. The vivid hues combine with a constantly moving camera to create one of the most distinct-looking films of any genre to emerge during the period. Adding to the surreal atmosphere is the booming score composed and performed by prog-rock group Goblin, who created rough versions of their music for Argento to play on the set while shooting scenes in which they would be featured. Another oddball touch: virtually the entire film was dubbed in post-production with no actual live sound remaining. Granted, this was the norm for the Italian film industry at the time, where it was deemed easier just simply redub films that try to record them live, but it does add an additional bit of weirdness that viewers pick up on even if they don’t know precisely what's unsettling them. “Suspiria” is famous for the murder set pieces devised by Argento, which remain some of horror's most infamous. The opening sequence depicting the murder of the student and her friend in the apartment building blends gut-wrenching terror and sublime style (one shot takes us inside the body of one of the victims, so that we can get a close-up of her heart being stabbed). Having set the bar astronomically high with the first murder scene, he then proceeds to come up with equally elaborate and fascinating designs for the other such sequences, all leading to a finale that truly defies description. The dance school setting suits a story that is as intricately choreographed as any ballet. Argento constructs it in such a way that the most horrific moments have a ghastly beauty. Even the blood splatters feel like a living (sort of) Jackson Pollock painting. The combination of the brutal violence, the strikingly beautiful way in which it is depicted and the fact that most of the victims of said violence are women have led to charges that both Argento and his film are misogynistic. Argento himself hardly did himself any favors when he did a 1983 interview in which he stated “I like women, especially beautiful ones. . . If they have a good fan and figure, I would much prefer to watch them being murdered than an ugly girl or man. I certainly don’t have to justify myself to anyone about this.” However, to dismiss him as simply misogynist, at least regarding “Suspiria,” is wrong because it ignores the numerous ways in which it is surprisingly progressive. Yes, most of the violence happens to women, but that is because this is a story where nearly all the roles are played by women and where the very few men that turn up along the way are either weirdos or spectacularly ineffective at best. Here, women control the action and are looked at as sources of real power. The character of Suzy is initially seen as hopelessly naive, but grows to become a strong, capable person. Argento is aided immensely here by the lead performance by Jessica Harper, a cult film icon who appeared in such oddball favorites as “Phantom of the Paradise" and “Pennies from Heaven," as well as the presence of such genuine cinematic icons as Joan Bennett (a favorite of Fritz Lang) and Alida Valli (whose credits include Alfred Hitchcock’s “The Paradine Case” (1947), “The Third Man” and “1900." Although the stylistic excesses and apocalyptic ending might have suggested that Argento could push this sort of material no further, he (no doubt inspired by its success throughout the world) announced that it would be the first of a loosely connected trilogy involving witchcraft in three different locations throughout the world. “Inferno” (1980) was in many ways even more over-the-top than its predecessor and even more unconcerned with niceties like plot and logic. It would probably have a better reputation in America if it had been given a proper theatrical release instead of finally emerging on home video in a cut version five years later. For decades, there were stillborn rumors of a third film but 2007 saw the release of the long-gestating “Mother of Tears.” Although a definite comedown from the artistic heights of its predecessors, it contained enough cheerfully weirdo moments, not to mention a central performance by the endlessly charismatic Asia Argento, to make for a reasonably satisfying conclusion. For years, there were also rumors of a remake of “Suspiria” that was at one point going to be directest by David Gordon Green before finally going before the cameras with Luca Guadagnino (“Call Me By Your Name”) directing an eclectic cast including Tilda Swinton, Dakota Johnson, Chloe Grace Moretz and Jessica Harper. It is tentatively scheduled for release next year. Regardless of the sequels, remakes, homages and ripoffs, “Suspiria” remains a truly one-of-a-kind cinematic experience. For horror fans, it is one of those touchstone titles whose significance has been passed down from generation to generation. Unlike many other horror films of its era, it has not aged a day and its formal beauties still put most current movies to shame. Those not immediately disposed to the horror genre may have a harder time getting into it—I cannot emphasize just how bloody it does get at times—but even they may find themselves responding to the incredibly skilled and self-assured filmmaking on display, even if they are doing it with their hands over their faces and from a crouching position. “Suspiria” truly is one of the absolute classics of the horror genre and anyone who considers themselves to be true students of the cinema owe it to themselves to experience it for themselves, especially if they get a chance to see it on the big screen where it belong. To help commemorate the 40th anniversary of “Suspiria,” it will be screening next week as part of the inaugural presentation of Cinepocalypse, a week-long presentation of old and new genre films being held at Chicago’s beloved Music Box Theatre. Not only that, the festival will be screening an uncut 35mm print of the Italian-language version that was uncovered earlier this year. To sweeten the deal even further, Jessica Harper herself will be on hand to participate in a post-screening Q&A. Any one of those elements would have made this screening a must-see but combine them together and you have one of the true cinematic events to hit town this year and one that should make for a truly unforgettable evening. To help promote the screening, I conducted the following brief email interview with Harper regarding her memories of making “Suspiria” all those years ago. Before making “Suspiria” and “Phantom of the Paradise,” both of which have been venerated by fans as horror film classics, was the horror genre one that you had any particular interest in personally? If so, what were some of the films that struck you as particularly memorable? The first horror movie I saw was The Wizard of Oz.” While some might argue that I’ve got my genres confused, as a five-year-old I found that movie terrifying. (C’mon, girl gets ripped from her home by a tornado? Captured by a witch? And those monkeys—are you kidding me?) I had nightmares for weeks after that. Then, in ’63, I saw “The Haunting”—the precursor to the 1999 remake—and I realized that while I admired the film’s artistry, I’d rather not, pay money to be scared to death. So, since I value my sleep and my nervous system, I’ve, since then, avoided horror movies, but I love being in them, being the scarer rather than the scaree. Before doing “Suspiria,” you had already appeared in films as varied as Brian De Palma’s “Phantom of the Paradise,” Woody Allen’s “Love and Death” and “Inserts.” How did “Suspiria” end up coming your way? What were your initial impressions of the screenplay when you first read it. Considering how rich and stylish it is from a visual perspective, I was curious as to how that translated into words on a page? The screenplay provided a loose structure, but it was impossible to imagine, based on those pages, where Dario’s precise and vivid vision would take the movie. The end result is so dependent on the art direction, cinematography, costumes, overall esthetic, and Dario’s genius. Taking on that role was, as it always is in film, a leap of faith. As is NOT always the case, this leap paid off—I got to be a part of something gorgeous and enduring. What was it like to work with Dario Argento? Dario was always a gentleman, very respectful and kind to me. He was also edgy, charismatic, and clearly overflowing with brilliance, so that you’d feel his presence in a room, and co-workers would defer to him on the set. His complete commitment to what he was creating was inspiring, and obviously paid off. Considering that you are put through the physical and emotional wringer throughout “Suspiria”—even just going through the airport has an undeniable tension to it—what were the most challenging scenes for you as an actress? The final scene, when I have to stab a witch and flee—that was a tough one. Finding and sustaining the range of emotions involved was challenging. But navigating those exploding hallways—glass flying, walls collapsing—with the responsibilities of doing it in one take and remaining unarmed? YIKES. In the film, you also got to work with a couple of veteran actresses in Alida Valli and Joan Bennett. As someone who was still in the early part of your own career, what was it like for you to work with them? Both legendary actresses taught me, by example, a few things about professionalism. Both were always prepared for the day’s shoot, gracious to all, and of course, wonderful to watch. Joan and I were closer. I was enthralled by her association with the Hollywood of another era. Loved it when she advised me, “Never let the paparazzi photograph you when you‘re smoking!” This was right out of the playbook of an earlier time. “Suspiria” is, of course, famous for the gruesome imagery on display in nearly every scene. While actually working on the set, did you have a sense of just how gory and intense it was going to be? I didn’t realize it would be that gory. Having said that, I don’t think it’s that bloody. I recently read I a review of “Suspiria” in which the critic suggested that if you want to see something really fast and gory, go see something else. Something involving a chainsaw, maybe. What was your reaction when you first saw the complete film? Even though you obviously knew what was happening with it, I imagine seeing it on the big screen and with the booming Goblin music must have still made for an intense experience. I don’t remember my first viewing of the movie. But that’s true of any of the movies I’ve been in. It’s always hard to process that original experience. It’s later, after I’ve seen a film a couple of times, that I’m able to REALLY see it. 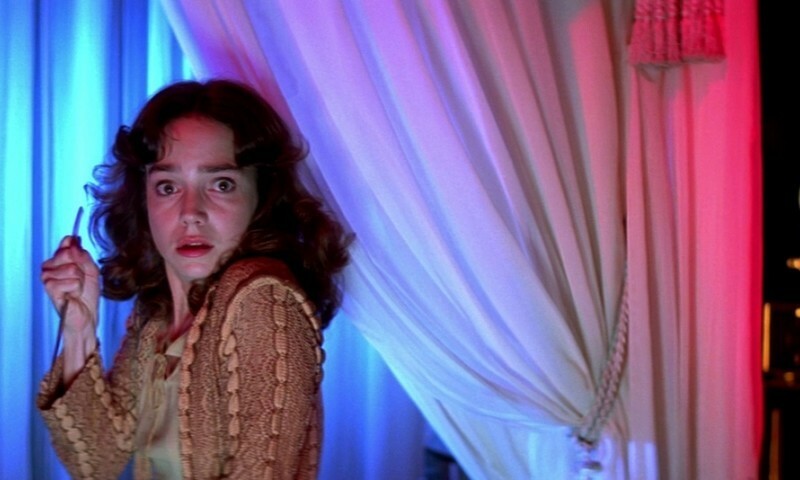 In the case of “Suspiria,” it only gets better. I watched a new Blu-ray version of it not long ago with my (millennial) daughter. It was amazing, and Nora pronounced it 'cool,' which is very high praise indeed. “Suspiria” would go on to become a cult favorite throughout the world and inspire generations of filmmakers and fans alike. Why do you think that it resonated so strongly with viewers and was there any particular moment for you when you realized that it had developed such a wide and devoted fan base? I believe the movie created such a stir and has longevity because of the strong and very particular aesthetics. It’s an art movie that is very unusual in the genre, and its artistry gives it broad appeal. I’ve always gotten mail and social media messaging from fans. But I got a better sense of the move’s reach when I learned that “Suspiria” posters hang in the halls of college dorms, that it is part of the curriculum in many film schools, that it is spoken of as one of the best ten films ever. This movie isn’t going anywhere; its life has just begun. During your career, you have appeared in a number of other films that have gone on to achieve cult status, such as “Phantom of the Paradise,” “Stardust Memories,” “Shock Treatment” and “Pennies from Heaven.” What was it that drew you to such offbeat material? I’ve always been interested in doing creative projects that went in a new direction—why do what’s been done? But I’ve never been quite sure if I’m choosing the offbeat, or if there’s something I project that draws offbeat directors to me! Either way, I’ve enjoyed all these projects, for many reasons, but in no small part because they rub up against popular culture. In recent years, you have written books and recorded children’s music but have largely stayed away from acting. Now you are returning to the big screen for the first time, I think, since “Minority Report” to appear in the upcoming remake of “Suspiria.” Do you see yourself getting back into acting again on a regular basis? I’m open to anything, but very choosy. If other roles come along that are as interesting as those I’ve had, I would love to play them. If not, I have a lot of other creative projects to gnaw on! What can you say about the new “Suspiria” and the role you play in it? Feel free to spoil it as much as you like—everyone reading this can surely keep a secret. Haha! Okay, all you secret keepers, here’s the scoop: I know nothing! I play a small role (not a grown-up Suzy) which I can tell you is very sweet and romantic and, from what I have gathered, haunts the movie at various times. But truly, the new “Suspiria” is much like the original in that the script (which bears a basic resemblance to the first) is entirely dependent on the interpretation and vision of the director (Luca Guadagnino). I have not seen any footage, only a few stills, which are intriguing, to say the least, and entirely different in style from Dario’s film.